Caribou crossing sign close to Kootenay Pass on Canada’s Highway 3. The South Selkirks herd is the last group of mountain caribou that still range back and forth across the international border between British Columbia and Washington and Idaho. Just north of the border Canadian Highway 3 crosses the Selkirk mountains over Kootenay Pass, where occasionally caribou are spotted by passing motorists, in Stagleap Provincial Park. North of Stagleap, the Nature Conservancy of Canada has acquired a large parcel of land with the intention of preserving and restoring vital habitat for this herd of mountain caribou--the Darkwoods Conservation Area. 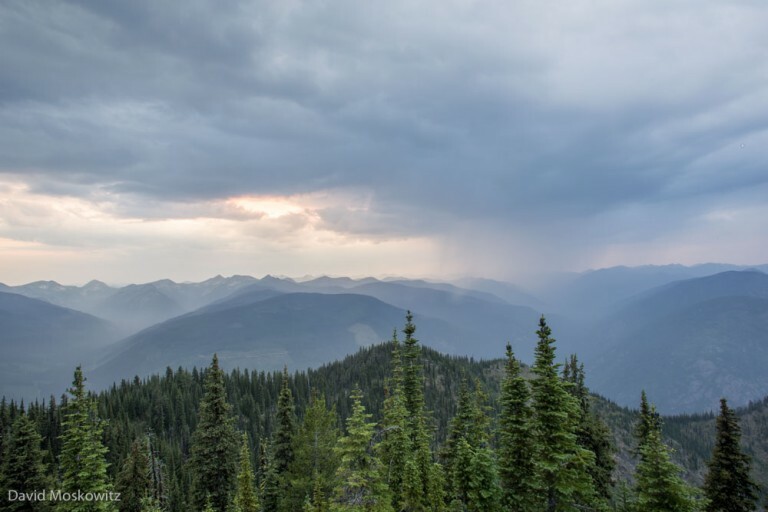 However, these mountains are far from pristine--both the provincial lands and the Darkwoods Conservation Area are crisscrossed with forestry roads, and clearcuts of all sizes and ages. In many drainages, it is only the upper ends of the basin that have been spared cutting at one point or another. 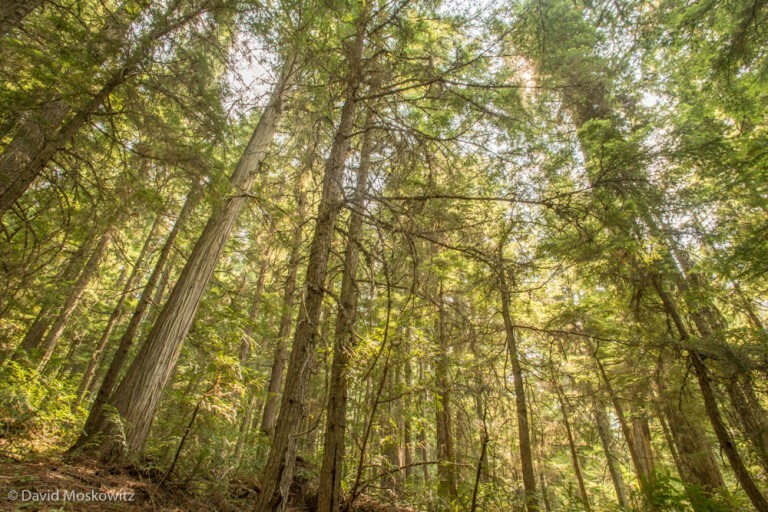 The Nature Conservancy of Canada purchased a large tract of land that had been previously managed for timber production. Since its purchase, along with stopping all timber harvest in caribou habitat within the preserve and protecting the existing uncut forest stands, the Nature Conservancy has been deactivating roads in caribou habitat. Stand of mature western red cedar and western hemlock preserved within the Darkwoods Conservation Area. Late successional stands such as this one are very rare in the southern Selkirks after decades of logging and fires at low and middle elevations in the region. 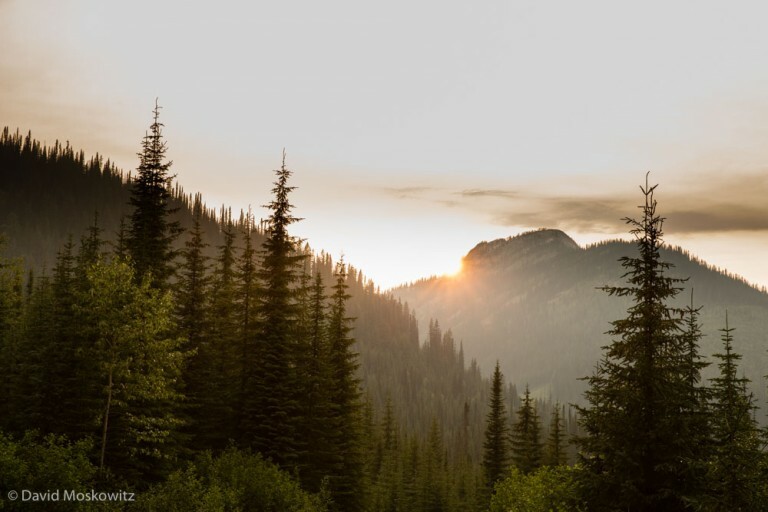 This landscape creates a maze of fragmented forest types for caribou to navigate while also leading to increased moose and deer populations at higher elevations. Kim Shelton joined me for a week to help search for caribou sign and carry photo equipment on ridiculous buggy bushwacks to several promising remote corners of these mountains. In a week of searching, location after location, where caribou where once abundant, we discovered the tracks and sign of moose, deer, and elk but the only tracks we found of caribou in a week of searching were a set of old tracks close to Kootenay Pass on Highway 3. 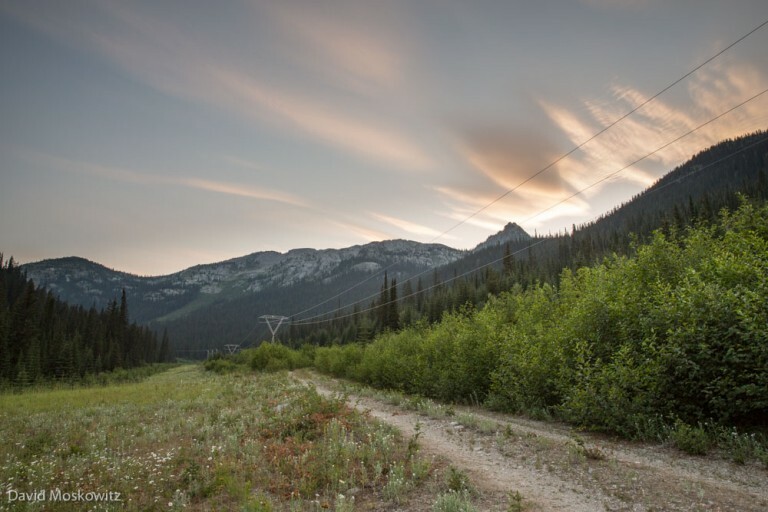 Linear features such as this road and power line corridor in the range of the Southern Selkirk herd, often act as routes for wolves, who hunt caribou, and humans, who’s presence can displace caribou, to access mountain caribou habitat. Wolf tracks along the road running alongside the power line corridor. The province of British Columbia has carried out extensive predator control in this area, killing wolves from three different packs in an attempt to protect the remaining 13 caribou in the South Selkirks herd. These predator control efforts have been extremely contentious amongst various groups involved in caribou conservation. Porcupine Lake in the Darkwoods Conservation Area. The Nature Conservancy of Canada completely removed a road that had been built into this lake to reduce human access and increase the quality of habitat for caribou in this subalpine basin. A large clearcut south of the Darkwoods Conservation Area, outside of the preserve on private timber land. The Nature Conservancy of Canada purchased Darkwoods to protect quality caribou habitat from ending up looking like this. The large round front print of a mountain caribou. 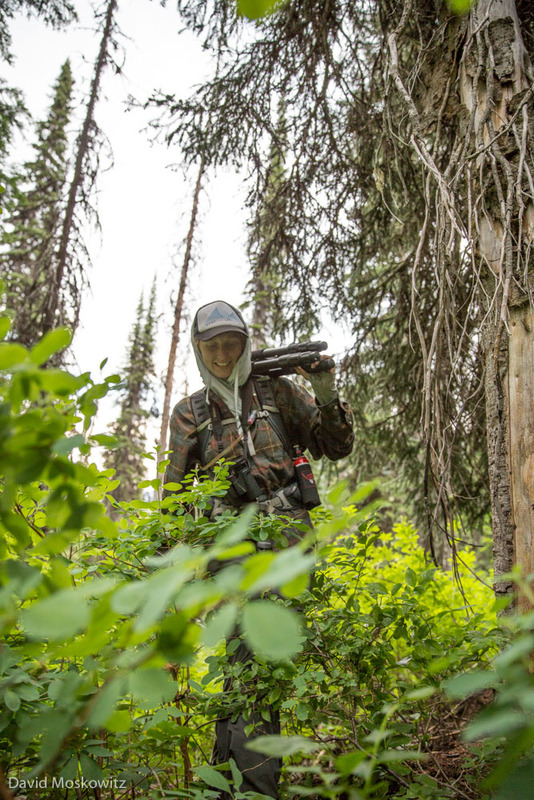 Kim Shelton plowing through the subalpine brush in the heavily forested Selkirk mountains searching for signs of one the remaining members of the Southern Selkirks caribou herd. Sunset on the dark woods of the Darkwoods Conservation Area.